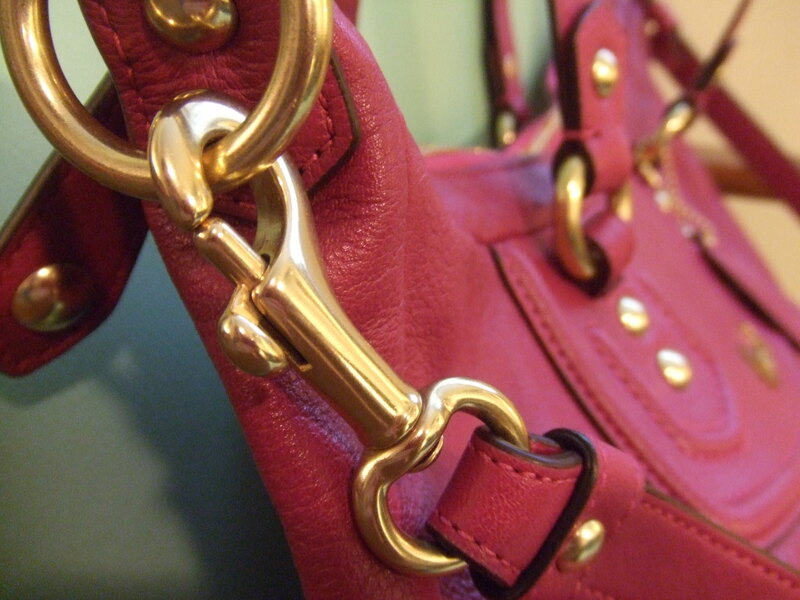 The investment bag. Just the phrase makes my eyes open wider. To some, these purses carry labels like Louis Vuitton or Mulberry; in my world, $100+ is quite the investment, and I expect something fantastic for that price. 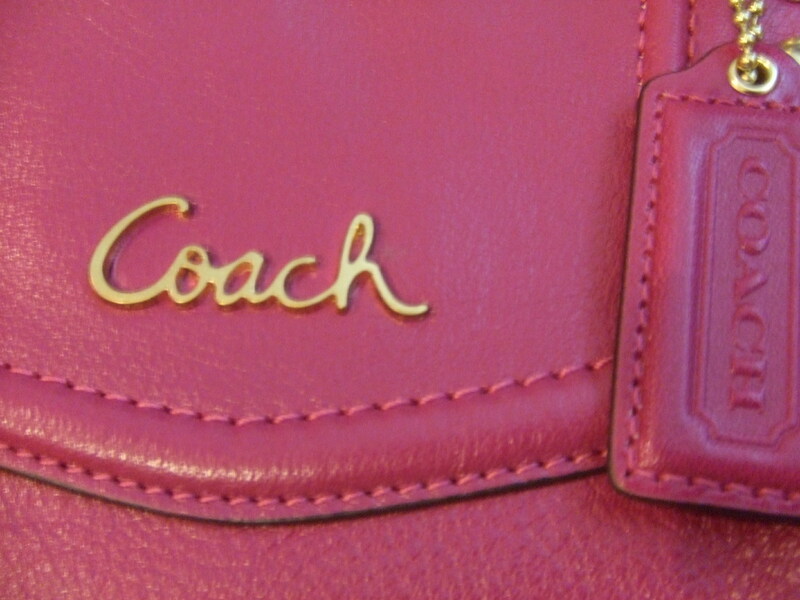 Enter the Coach Factory store, and the beautiful purse I found there. 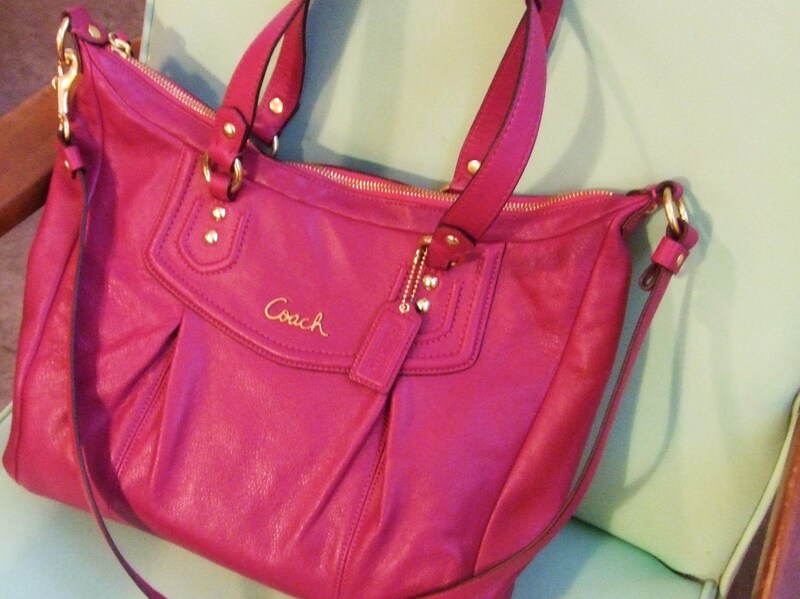 Originally priced at $398, I purchased the bag for $137– great deal, I know, I know. Isn’t it pretty? And, for fun, here’s what’s inside. 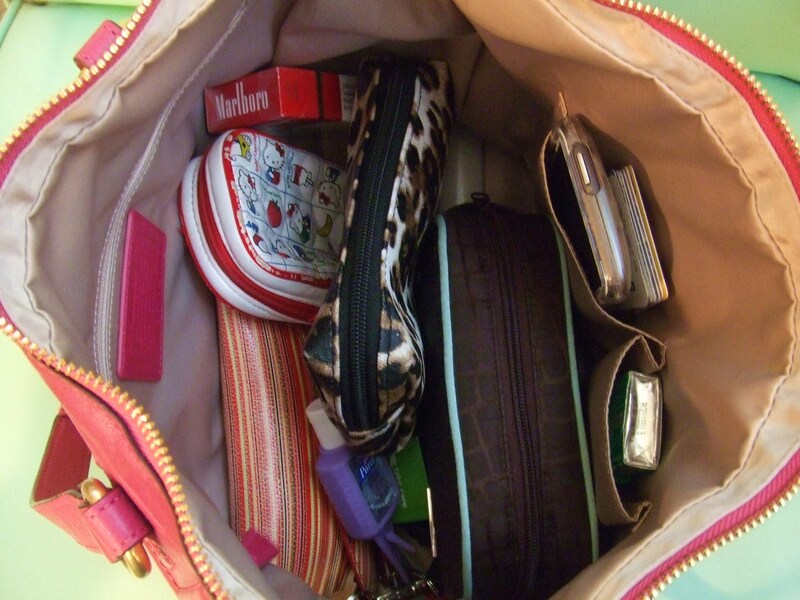 Maybe I’m just nosy, but I love seeing what other ladies carry in their bags, so it’s about time I do the same. Inside the bag… H&M sunglasses, Urban Outfitters orange stripe wallet, cosmetic bag, technology case, Fujifilm FinePix Camera + Sanrio case, HTC Inspire Android Smartphone with Skin It cover, Trident, Hampton Inn mints, Keys, HotHands, Disney World Passes, Leftover Dave & Buster’s cards, Disney World smashed pennies, random alligator drawing from Pictionary, Marlboros + Bic, Purse Hippo*. *Purse Hippo was a teeny gift from Lance last year. We went to the St. Louis Zoo the day before my birthday and, since I find hippos to be hilarious, he bought me a plastic figurine and deemed him “Purse Hippo”– the mascot of the inside of my purse. 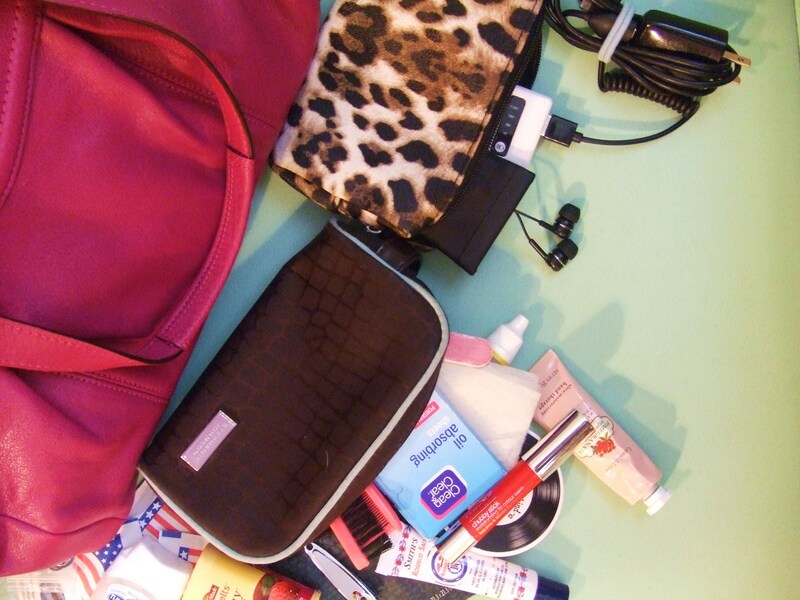 Technology Case: SOHO Leopard Case, Rayovac Back-Up Charger for Mobile Phones, Mini USB Coiled Cord, Mini USB Wall Charger, Skin-It Headphones + case. 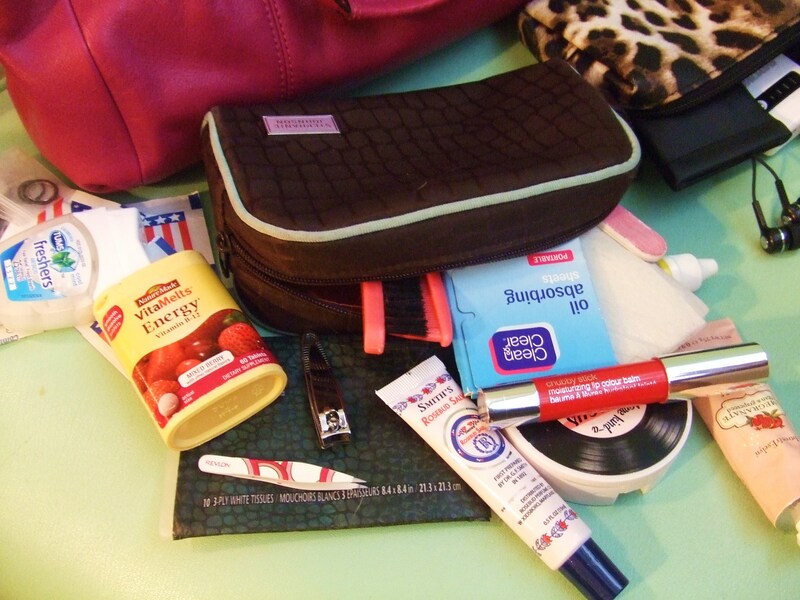 Cosemetic Bag: Stephanie Johnson Cosmetic Bag, Tums Freshers, NatureMade VitaMelts in B12, tweezers, file + nail clippers, Ulta comb + brush combination, Kleenex, dryer sheet, Clean & Clear Oil Blotting Papers, bandages + assorted Moist Hand Wipes, eye drops, Smith’s Rose Bud Salve, Benefit Some Kind-A Gorgeous Foundation in Lite, Clinique Chubby Stick in Two Ton Tomato, Crabtree & Evelyn Ultra-Moisturising Hand Therapy Cream in Pomegranate Argan & Grapeseed, hair Pins, hair elastics, extra hinged nose hoop. Now, I just need ideas on a new (highly, highly discounted) wallet, as mine is starting to rip. Any ideas? Good idea! Thanks for the store tips. I’ve never heard of Bluebird… Sounds like a new virtual time waster. Ha! 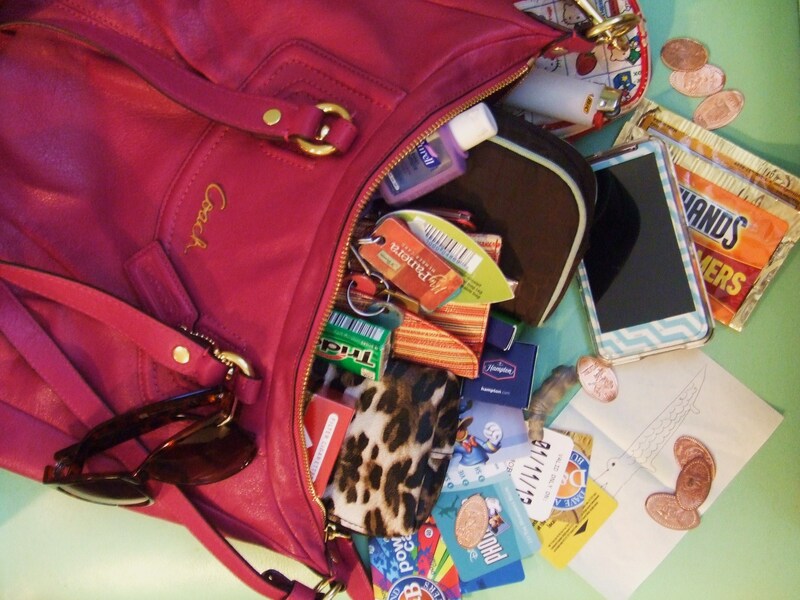 You have such a well organised inside of bag! I’m sure if I took photos of my bag like that it would be a shocking mess. 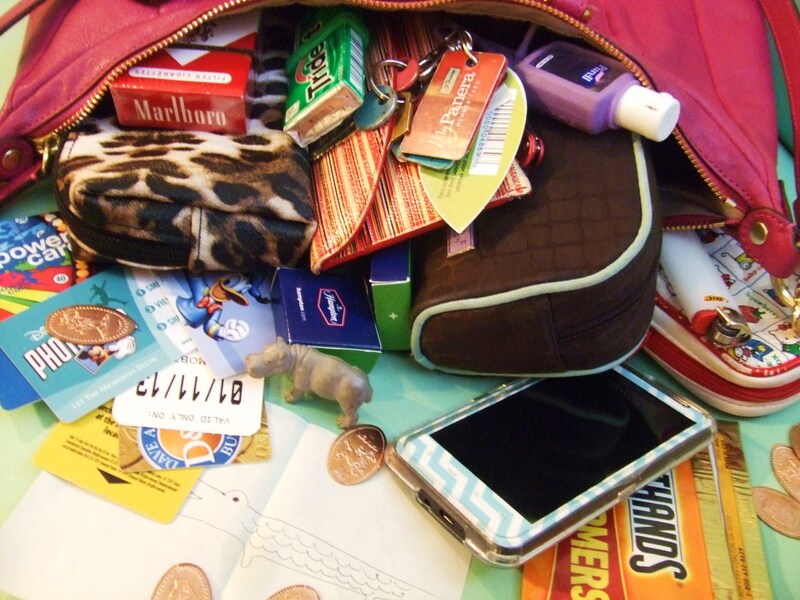 I make myself compartmentalize everything to make switching bags easier. It’s also way less embarrassing when Lance grabs the car keys out of my bag if it’s more organized chaos than panic attack.